Sew all kinds of holiday sewing crafts, from the 4th of July to Christmas. there is a craft here that will help start the celebration. Get family and friends in the spirit of the holiday when they step into your home decorated with homemade items. 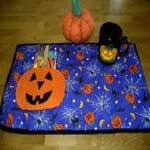 Choose from an angel, snowman, pumpkin, patriotic place mats, heart towels, Easter kite and lots more. Start sewing your favorite holiday decor for a beautifully decorated home. Over 20 different sewing projects for Christmas. Ornaments, angels, snowmen and more. 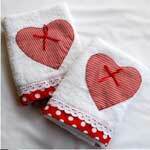 Free step-by-step directions to make heart hand towels. Makes a great decoration or gift. 9 different holiday projects with instructions and patterns. 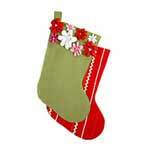 Included are tree skirts, fabric pumpkin, Easter kite, stocking and more. Having a 4th of July celebration picnic? 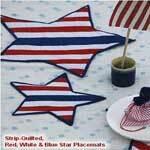 In just 5 easy steps you can make red, white, and blue star placemats. 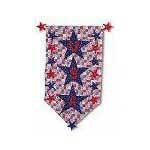 Show your patriotic colors while entertaining. 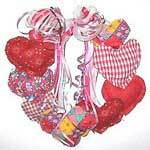 Use these simple instructions to make a cute heart wreath. Great for Valentines decorations. Simple sewing patterns with instructions for Fall, Halloween and Thanksgiving. Makes great decorations for your home during harvest time. 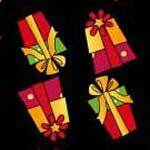 Instructions with template on how to make felt stockings. Stockings look great on mantle or even all the wall. Great project to enjoy with the kids. 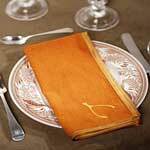 Step-by-step directions on how to make your own customized holiday napkins. Follow the written directions or watch the video. How to make felt pumpkin people. Great decoration for the fall. Video included with instructions. Free instructions and patterns to make placemats. Great for Halloween, Thanksgiving or just for the fall. It even holds your eating utensils. 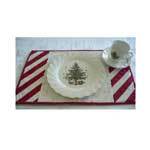 Free instructions on how to make diagonally striped placemats. Great for Christmas or even birthdays. 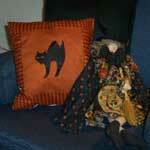 Simple sewing projects with instructions for Fall, Halloween and Thanksgiving. Makes great decorations for your home during harvest time. 8 different crafts for Christmas decorations. 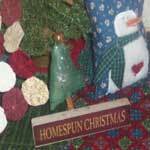 Ornaments, table runner, snowmen, candle mat and more. 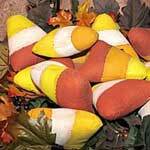 Fill a bowl with giant stuffed candy corn. 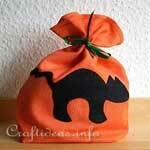 Instructions on how to make this cute black cat Halloween bag. 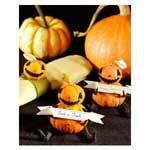 Great for decorations, gifts or for trick-or-treating. May vary the size accordingly.